Bradley Wilson-Dean (blue helmet) and Chris Harris will be key men for Panthers against Redcar. Peterborough Panthers begin a crucial week as they attempt to salvage their SGB Championship season. The city side have fallen 12 points off the play-off pace again after slipping to a 50-40 home defeat at the hands of Sheffield on Friday (July 14). 'No show' Panthers' guest rides for Redcar. 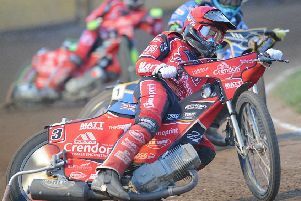 But they can eat into that gap during a busy spell in which they face Redcar three times in a week, starting with a showdown at the East of England Arena today (July 16, 5pm). They will attempt to follow up a 52-40 success in the reverse fixture 10 days ago before also returning to the North-East on Thursday (July 20) and then having another home date against the Bears next Sunday (July 23). And the significance of this spell is not lost on Panthers team boss Carl Johnson, who will stress the importance of bouncing back to winning ways to his riders. “It’s pretty clear the next few days are going to be very important for both teams,” said Johnson, whose men have also knocked Redcar out of the KO Cup this season. “We’re still determined to do all we can to reach the play-offs and a good run of results against Redcar will boost our prospects of doing that. “We’ve beaten them once at home and twice away so far this year and hopefully we will be able to keep that run going. “Slipping up against Sheffield on Friday was obviously not what we wanted, but we couldn’t have any complaints about the outcome. “Bouncing back from a disappointment in the right way is a sign of a good team – and that’s what I’ll be asking for the boys to do today. “But we know it will be far from easy. Redcar are chasing a play-off spot themselves and they’ll also be looking for revenge for our win up there a few days ago. Panthers are at full-strength as Bradley Wilson-Dean slots back into the main body of the team after missing the Sheffield loss due to an SGB Premiership outing for Swindon on the same night. He scored a paid maximum in their win at Belle Vue. And Panthers welcome Simon Lambert back into the fold at reserve following his lay-off with a broken wrist, which required surgery. Redcar expect to have a couple of their own injury victims back in action. Number one Jason Garrity and Charles Wright, who scored a maximum at Alwalton earlier in the season, are both declared to ride. The Bears team also features Ben Barker, who controversially pulled out of a planned guest booking for Panthers at Glasgow last weekend. Club chiefs called for him to be banned for his no-show in Scotland on a day when he was seen practising elsewhere despite reportedly being ill. But the authorities have taken no action and that means Barker will be in action at Alwalton today. Johnson added: “Everyone is well aware of what went out and our feelings on it, but it’s in the past now as far as we are concerned. “All we will be focusing on today is making starts, winning races and scoring points to make sure we pick up the victory we need. Panthers’ trip to Workington was rained off yesterday. PANTHERS: Tom Bacon, Chris Harris, Jack Holder, Simon Lambert, Ulrich Ostergaard, Paul Starke, Bradley Wilson-Dean. REDCAR: Jonas B. Andersen, Danny Ayres, Ben Barker, Fernando Garcia, Jason Garrity, Ellis Perks, Charles Wright.